We are the only Manufacturer in the USA that produces a Heat Exchanger designed for:(RTT) Rapid Thermal TransferTM using Axis Point Technology (APT) TM. This is where the exhaust gases from a Combustable Engine reach all the Spiral Tubing that carries the water heating it at all Axis Points of the tubing simultaneously. The Industry's Conventional Standard all use either Layered Spirally Wound Tubing on each other where Heat Conductance is lost between the Layers of Tubing. The other method uses "TUBE IN A SHELL" Straight Tubes going through a Chamber (Pipe) where the Void for the water is greater and the Volume & Number of Conductance Tubes that carry the Exhaust gases are too few. ALSO, "TUBE IN A SHELL" CAN DAMAGE YOUR TRUCK MOUNTS ENGINE BECAUSE OF THE BACK-UP PRESSURE. 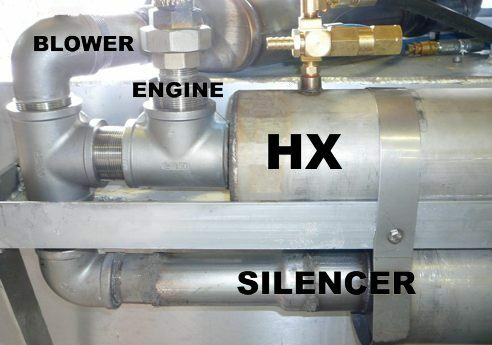 THE ENGINE'S EXHAUST ENTERS A SMALL COMPARTMENT CHAMBER WHERE IT IS FORCED TO ENTER SMALL ELONGATED CONDUCTANCE TUBES CAUSING A BACK-UP PRESSURE ISSUE. This is why the Industry Standard is less effective and inefficient in Thermal Transfer into the water. 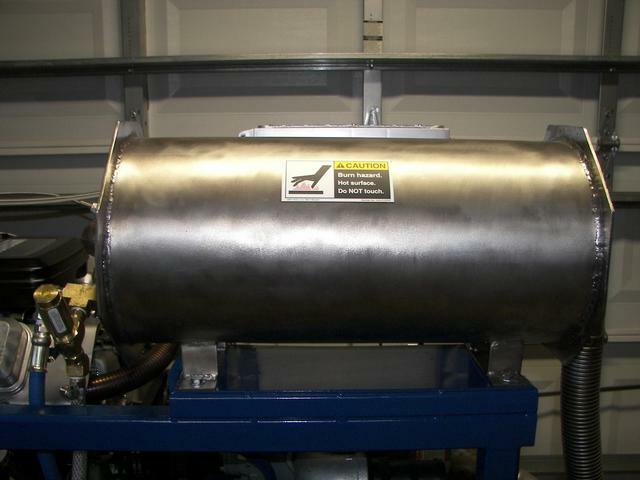 As a result of our NEW Patented All Stainless Steel Heat Exchanger is internally designed to Transfer Exhaust Heat Quicker (Within 2 Minutes) and more efficiently than any other competition Heater.....and with Minimal Back-up Pressure to make your Engine Last a Long Time. This means Continuous Hotter Water Lasting Longer up to 230 degrees F plus during the most soiled carpet cleaning conditions. Great for Pressure Washing where High Pressure & Temperature is needed. REMEMBER, CONSTRUCTION AND DESIGN DOES MAKE A DIFFERENCE! Large Compartment allows "FREE FLOW" with Minimal Back Up Pressure. "Your Engine will Love you for it."